Terry Fox was a great unifying spirit for all Canadians, touching each individual Canadian in a profoundly personal way. For me, Terry Fox was a contemporary and the entire story of his Marathon of Hope resides vividly in me. His story remains alive in me because he made me so keenly aware of myself and my place in the world at an important time in my life. My wife is younger than me and remembers him in ways differently from me, yet his story inhabits in her for similar reasons. I have visited his Marathon of Hope starting point in St. John’s and spoke to the Mayor of that city about the events preceding and up to the beginning of the intended cross-country run. On display in St. John’s City Hall is a collection of photographs and letters of Fox at the start of his run. They are shocking to see. The weather looked very cold—judging by the many others in the picture donning heavy coats—but there he was wearing only shorts and a T-shirt. He was also so very young. How does one pay homage to someone whose greatness is transcendent? For the Legacy Art Project Toronto…Inspired by Terry Fox, and in collaboration with space2place Landscape Architects, I thought about a landscape of gentleness, variation and peaceful respite. Many Paths to a Common Goal is the title of my proposal. The title suggests an idea of many ways to experience the park within its modest expanse; to welcome a diverse range of perspectives within a collective space. I guess that one of the most important things I’ve learned is that nothing is ever completely bad. Even cancer. It has made me a better person. It has given me courage and a sense of purpose I never had before. But you don’t have to do like I did […] wait until you lose a leg or get some awful disease, before you take the time to find out what kind of stuff you’re really made of. You can start now. Anybody can. The quote is profoundly moving. It is also a remarkable call to action for people to live life as fully as possible. Within the park, seating and gathering is afforded by the gentle slope of the grass mound and an extended, multi- tiered bench at the North West end of the plaza. An additional bench is included on top of the mound with views towards Lake Ontario. The park’s circulation celebrates the journey of Terry Fox. Included is a map of Terry’s intended route from St John’s to Vancouver. The map takes the form of an irregular line traversing the park from the north end, adjacent to Queens Quay, and extending to the lakefront. Concrete rings engraved in the paving depict Fox’s starting point at St. Johns near the park entrance, his end point near Thunder Bay at the edge of the plaza’s Feature Wall where it intersects with a Sculptural Wall, and his intended completion point on the West Coast of Canada, marked flush on the Waterfront Trail. The park is designed to improve connectivity to its surrounding context. 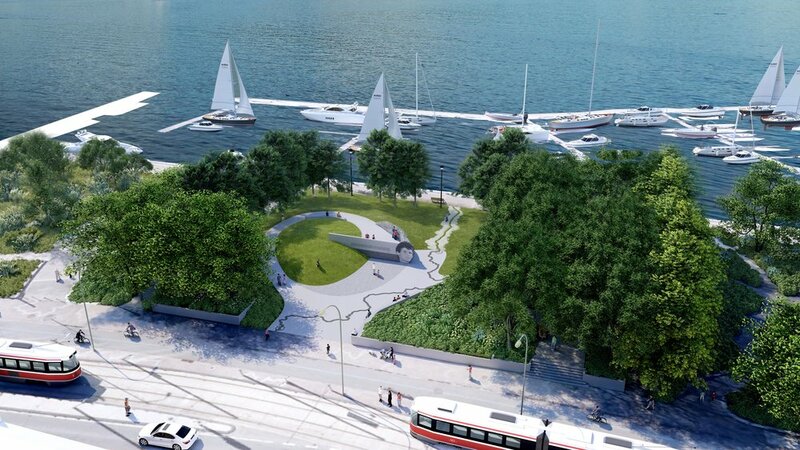 The site can be entered from Queen’s Quay and the Martin Goodman Trail, the Waterfront Trail, or pathways connecting to the Spadina Quay Wetlands and Toronto Music Garden. In its totality, the park should be experienced as a place of gentleness where visitors may accrete into self-reflection about one’s place in a better world. This is an idea that Terry Fox lived and died by.